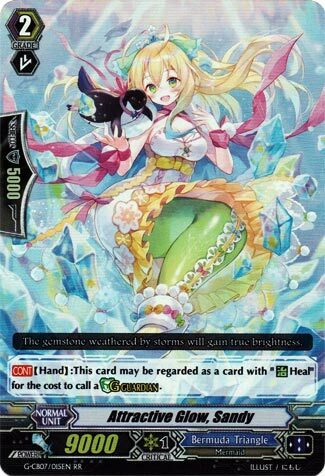 [CONT](Hand):This card may be regarded as a card with “Heal” for the cost to call a G guardian. So what we’re looking at is 8 potential cost targets to just spam G Guardian Elly over. And over. And over. I see this being used to great success in Ange at least simply due to the lasting staying power the deck gets from this. Unfortunately, unless your deck is good at bouncing mid Battle Phase, running this is going to cut down on your potential attackers, since you’ll want to save this for the defensive gains. Still, that’s on average 8-9 attackers left over and an Ange deck has a G3 you want to call so that’s not much of a drawback. Elly makes this. Without that, she’s nothing. What’s up, Rogue Squad?! To wrap up this week, we’re looking at the only non-trigger unit in the game that can call out G Guardians…and my god, do I hate this card in regards of facing it. Most people are going nuts with a 16-Crit build and four of this to still G Guard, and it works…sometimes…but seriously, this does allow players to experiment with how they can really have some fun with their Trigger lineup if they’d like while still holding a great insurance to be capable to G Guard when they don’t have a Heal I hand to ditch. Sandy is one of those cards where if you have room to play it, then give it a go. Previous articleThe 4 Formats of 2014 – Yu-Gi-Oh!